Explanation: What created this great arc in space? 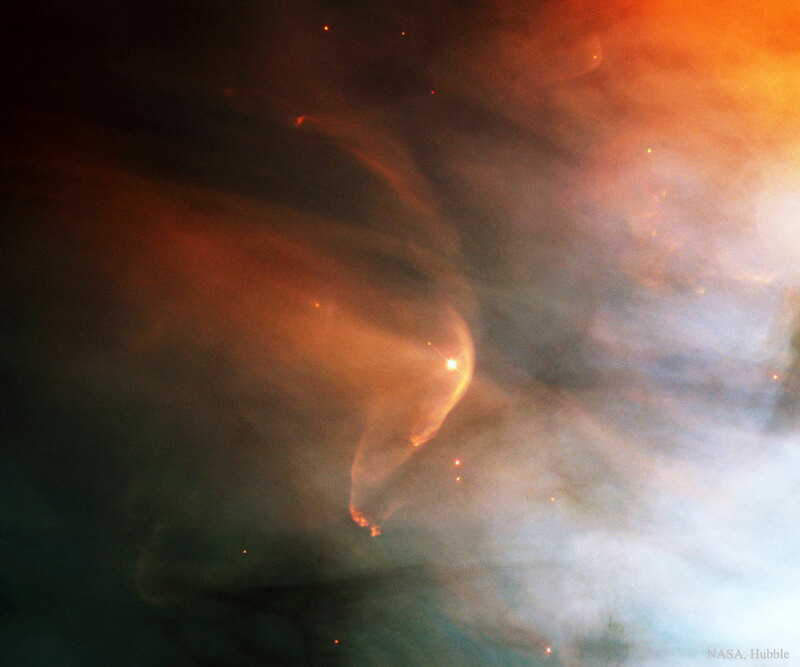 This arcing, graceful structure is actually a bow shock about half a light-year across, created as the wind from young star LL Orionis collides with the Orion Nebula flow. Adrift in Orion's stellar nursery and still in its formative years, variable star LL Orionis produces a wind more energetic than the wind from our own middle-aged sun. As the fast stellar wind runs into slow moving gas a shock front is formed, analogous to the bow wave of a boat moving through water or a plane traveling at supersonic speed. The slower gas is flowing away from the Orion Nebula's hot central star cluster, the Trapezium, located off the lower right hand edge of the picture. In three dimensions, LL Ori's wrap-around shock front is shaped like a bowl that appears brightest when viewed along the "bottom" edge. The complex stellar nursery in Orion shows a myriad of similar fluid shapes associated with star formation, including the bow shock surrounding a faint star at the upper right. Part of a mosaic covering the Great Nebula in Orion, this composite colour image was recorded in 1995 by the Hubble Space Telescope.